So, are you a Soft & Chewy or Crispy & Crunchy? An All-American favorite, the chocolate chip cookie was born at the Toll House Inn in Whitman, Mass. sometime in the 1930s at the hands of Ruth Graves Wakefield. Wakefield's contribution to the culinary world seems nothing short of legendary - whose childhood didn't include a formative Cookie Moment? As David Leite writes, "Too bad sainthood is not generally conferred on bakers, for there is one who is a possible candidate for canonization. She fulfills most of the requirements: (1) She’s dead. (2) She demonstrated heroic virtue. (3) Cults have been formed around her work. (4) Her invention is considered by many to be a miracle." 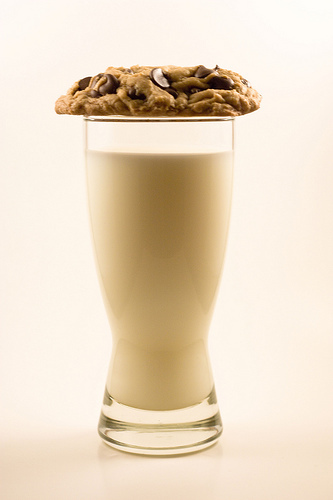 Exactly how these illustrious cookies came to be is still a mystery - something about a bar of chocolate falling into the bowl of an electric mixer or perhaps Mrs. Wakefield's own ingenious idea - but they have taken the nation (and world?!) by storm. With thousands of variations, hundreds of secret family recipes and the foundation of countless childhood memories, Mrs. Wakefield certainly stumbled across something exciting. Anyone who has performed serious research on chocolate chip cookie baking knows of the age-old debate between butter (never margarine!) and shortening (okay, let's be straight: lard). 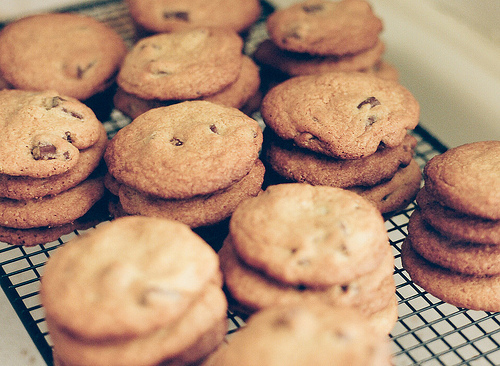 Butter is said to promise softer, chewier cookies while shortening claims the best results in some circles, producing crispy-on-the-outside, chewy-at-the-center cookies. Winner? Maybe not. After interviewing several master bakers, the New York Times seems to have stumbled across the secret: chilling time. Unlike the current Toll House recipe which recommends beating and mixing and then immediate baking, even Mrs. Wakefield put her dough on ice overnight before baking them up for ravenous patrons of the original Toll House Inn. Here's the skinny on creating baked perfection: "At 12 hours, the dough had become drier and the baked cookies had a pleasant, if not slightly pale, complexion. The 24-hour mark is where..the cookies browned more evenly and... was richer, with more bass notes of caramel and hints of toffee... At 36 hours, the dough was significantly drier [and] baked up the most evenly and were a deeper shade of brown than their predecessors. Surprisingly, they had an even richer, more sophisticated taste, with stronger toffee hints and a definite brown sugar presence. At an informal tasting, made up of a panel of self-described chipper fanatics, these mature cookies won, hands down." This is not to say that beat-and-bake cookies aren't delicious, it's all in the texture. Tempted? Set aside some time and remember, the longer you can hold out and let the dough chill in the fridge, the better the results! Not into crispy-edged soft-centered goodness? Sunset Magazine offers recipes and cooking suggestions based on your favorite adjectives: thick & chewy, thin & crispy or the best of both - thin, crispy AND chewy! For something a little bit different and with promises of perfection, try these Best Ever Chocolate Chip Cookies, featuring ground oatmeal for dense and delicious cookies! Photos by yurilong and idovermani.